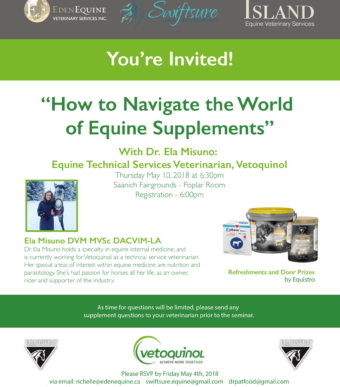 If you would like to learn more about feeding our equine companions, please come to our upcoming lecture “How to Navigate the World of Equine Supplements” with Dr. Ela Misuno on Thursday May 10th. As time for discussion will be limited, if you have any specific supplement related questions please send them to us ahead of time. Dr. Misuno will do her best to address any popular questions in a time efficient manner. Please RSVP by Friday May 4th. 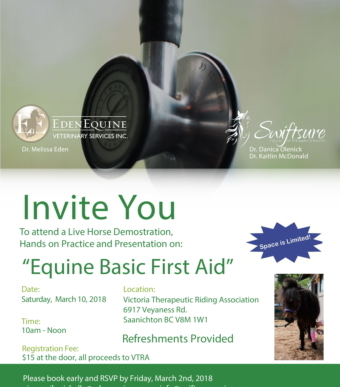 Please RSVP to info@swiftsureequine.com to reserve your spot. experience in first aid treatments and techniques. 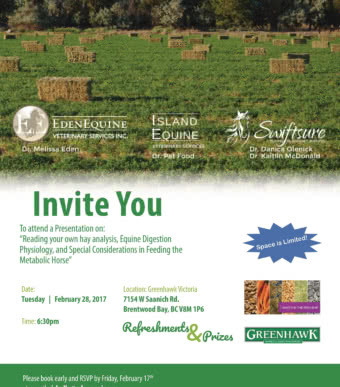 Please RSVP to info@swiftsureequine.com. Space is limited! Fee is $10 per participant. Proceeds will be donated to the VTRA. A Vetoquinol sponsored lecture on Parasite Management will be presented by Dr Ela Misuno. It will be held in the Dogwood Dining Room at the Saanich Fairgrounds on Thursday Nov 2 at 6:30pm. See equine parasites with your own eyes learn what’s new in deworming protocols! 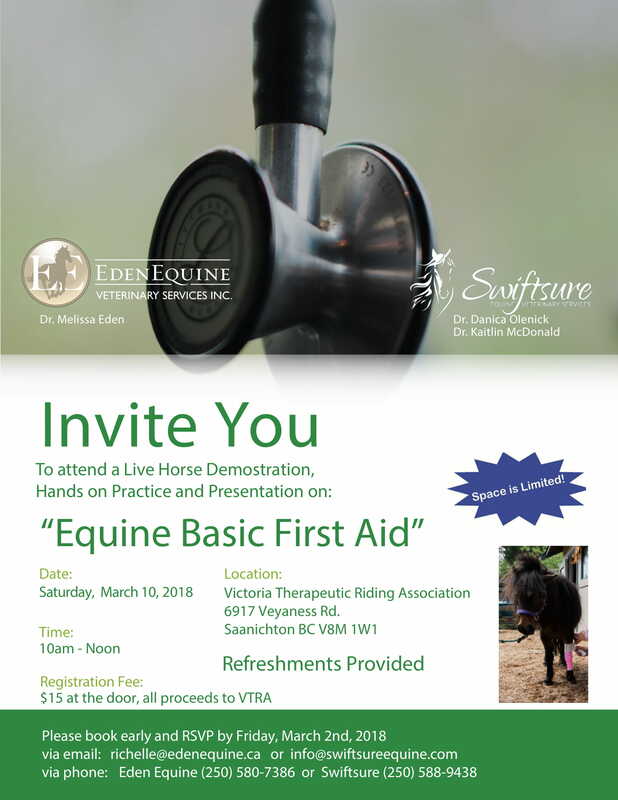 Please RSVP to swiftsure.equine@gmail.com to reserve your spot. Equine Gastric Ulcer Syndrome is currently a hot topic that is actively being researched. We continue to receive new and sometimes conflicting information and instructions on how to best manage it. 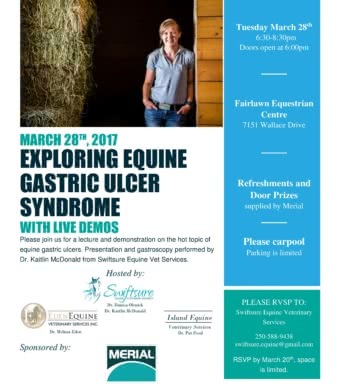 Please join us for a lecture and live demonstration on Equine Ulcers performed by Dr. Kaitlin McDonald. Due to popular demand we have added another Nutrition Lecture date! The first lecture will be February 28, 2017 and the next one will on March 7th 2017. As winter hay stores are getting low, and choosing an appropriate hay and feed are common concerns for many of you, we are frequently asked to interpret hay analyses. 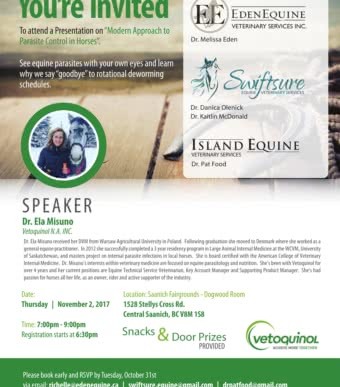 To try to demystify the numbers provided in a hay analysis and balance your feeding program, Drs Danica Olenick and Melissa Eden will be hosting an evening lecture on addressing the equine digestive tract, interpreting your own hay analysis, and some special considerations for the metabolic horse. 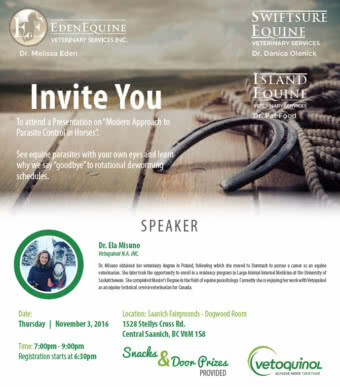 Please RSVP to swiftsure.equine@gmail.com as space is limited.